Many Americans now understand that, no matter whom we elect—and we’re always hoping for that next great candidate—political outcomes seem to get worse. And some of the most capable people we have elected to public office have quit out of frustration because they have no impact. One thing has become abundantly clear: Our political system will not be self-correcting. The problems are systemic and structural, involving multiple factors that are self-reinforcing. This means that the only way to reform the system is with a set of steps to change the industry structure and the rules that underpin it and, therefore, shift the very nature of political competition. We need to move from today’s unhealthy competition to healthy competition that holds elected officials accountable for delivering the desired outcomes in politics: solutions, action, and broad-based consensus. We admit to a bias that moderate, compromise-oriented politicians have an important value in crafting and delivering solutions to the nation’s problems. We are not suggesting, however, that moderates are the only valuable kind of elected official. Historically, transformational changes in the U.S. have often begun at the fringes—in decidedly non-moderate camps. Eventually, however, change must be enacted by a majority in democratically-elected legislative bodies. It is here that bipartisan, pro-problem-solving, consensus-seeking moderates are crucial for delivering practical solutions, and it is precisely this genre of elected officials that our current political competition has rendered almost extinct. We believe reinvigorating electoral opportunities for the rational middle must be a central premise of political reform. There are a growing number of political reform initiatives involving a wide variety of approaches. The question is: In which ones should we invest? Which reforms and innovations have the greatest potential to fundamentally alter the ability of the political system to deliver outcomes that matter for the common good? In order to produce real change, our analysis of political competition suggests a set of key principles for reform. Reforms must be both powerful and achievable. For a reform to be powerful and, therefore, have real impact, it must attack the root causes of poor political outcomes, not just the symptoms. For example, we cannot change the system just by electing “better” people (though that certainly never hurts). Even promising candidates would continue to disappoint, because they would be trapped in a system that no single individual can overcome. Many well-meaning reform ideas—such as promoting bipartisanship, instituting a national primary day, improving civics education, and establishing bipartisan issue-advocacy groups—won’t matter much absent changes in the underlying industry structure. Deeper systemic changes that alter the parties’ competitive dynamics will be required to produce real impact. Even powerful reforms, however, must also be achievable within a reasonable time frame. The need is too urgent to be distracted by reforms that, while theoretically powerful, are not likely to be achievable in the next decade or two. For example, a constitutional amendment for campaign-finance reform may be desirable, but it is highly unlikely to pass. 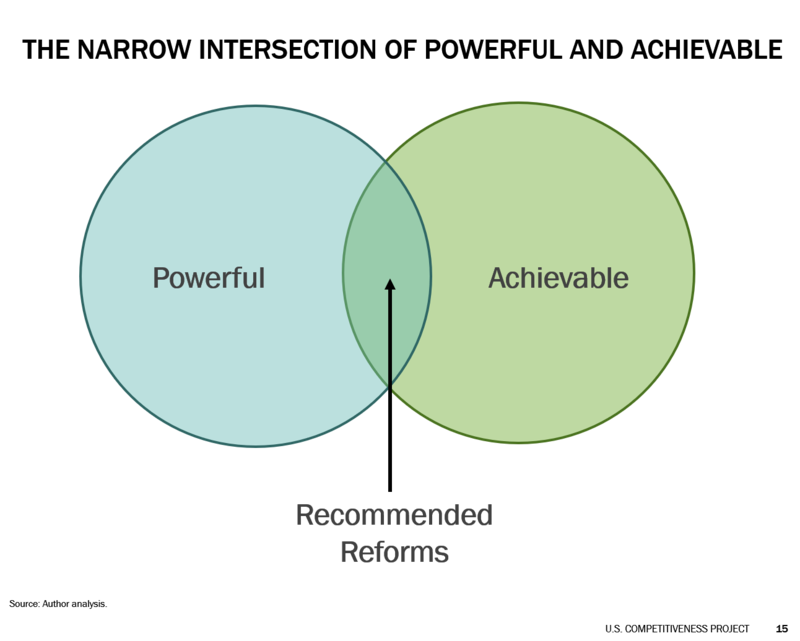 Conversely, some reforms may be achievable, but not powerful. Term limits are a good example, because they do not sufficiently change the structure of competition. New candidates would face the same pressures to move to the extremes as incumbents do, while newly elected officials would still face the same obstacles to achieving solutions. No matter how well-intentioned, then, only reforms that are at the intersection of powerful and achievable will make a difference. We shouldn’t waste our time on reforms that aren’t both (see Figure 1). Note that “achievable” doesn’t mean “easy.” Unfortunately, there are no reforms at the intersection of powerful, achievable, and easy! There is no one silver bullet. Given the nature of industry structure, reforms on multiple fronts will be necessary to shift political competition sufficiently so that it results in good outcomes. For example, campaign- finance reform, which has consumed so much recent attention, is surely needed. However, money is not the only problem. As we have discussed, partisanship and gridlock are structural issues created by much more than campaign-finance rules. Reforms must address multiple aspects of the structure. Reforms are needed in both elections and governing. Election and governing rules are both key parts of the industry structure, and reforming each will reinforce the other. Reforming elections will provide opportunities for new kinds of candidates who are answerable to voters instead of to the duopoly and its core customers. But election reform will be more effective if governing reform also gives all legislators more influence. And support for governing reform will be greater if a shift in elections results in less partisan candidates not beholden to the duopoly. Reforms should be cross-partisan. The reform movement should engage citizens across the ideological spectrum. It should not be used as a Trojan horse for partisan advantage. Historically, both sides of the duopoly have sometimes championed changes to the system under the guise of “reform,” when they were really trying to change the system in ways that were more likely to disproportionally benefit their side. Many reforms will need to be enacted state by state, and will require state-specific strategies. State constitutions and legislatures are responsible for most of the rules that enable the duopoly’s core control of elections, so it is not possible (in most cases) to mandate changes once they reach the federal level. Each state will need to follow its own laws and constitutional provisions to enact reform. Therefore, reformers will need to evaluate each state individually and tailor winning strategies state by state. Legal challenges. Certain reforms have the best chance of success through court action that challenges the constitutionality of existing practices. Or, court action may be a complementary strategy for referendums or legislative action. state legislators work for the voters. If enough voters want reform and organize to demand it, legislators will respond. Shortcuts that work around the current politics industry structure will be beneficial. There are steps (described later in this section) that can build momentum and deliver important near-term benefits, even before more systemic changes are enacted at scale. Some wins can show that change is possible— reversing the vicious cycle of citizens dropping out of politics— and generate a sense of hope that will lead to further progress. Since much of the design of our political system is not specified in the Constitution, we can change it. While progress has already begun, a realistic time frame for systemic reform is a decade or even two. And the ever-present risk that private interests find new ways to optimize the system around their interests, instead of the public interest, means the task of protecting healthy political competition will never be complete. Ongoing vigilance will be required. Already, many outstanding, dedicated, and passionate activists are working to improve our system. Together they are creating a strong organizational foundation on which to build, and many are addressing reforms that are at the intersection of powerful and achievable as we just described. In each area, we include links to the websites of specific organizations that are working on it. Business has a major stake in the success of our political system: in the nation’s ability to take the steps necessary to support economic growth, to improve the U.S. business environment, and to better prepare citizens for participation in the economy. Business cannot be successful unless America is successful. Companies should be advocating for policies that make the environment better for all businesses. A good example is Simpson-Bowles, which we discussed in Part I. This plan would have put America’s federal budget on a sustainable path and created a far better macroeconomic environment for investment and stability. Given the nature of today’s political competition, however, too many businesses have become special interests instead of advocates for the general interest. They pursue special benefits for their companies and their industries, and they fail to put their weight and influence behind policies and steps that benefit business in general and the communities in which they operate. Lobbying by business and industry associations has become a huge business in its own right, but contributes to eroding competitiveness in America, while undermining public support for business. Companies and their trade associations have also increasingly hired sympathetic former members of Congress who sit on key committees to gain influence, in a process that distorts policies and regulations. duopoly wants business to play. Studies show that the ROI on lobbying in today’s political system is high, as we discussed in Part II. Companies too often fall into the trap of believing that, if they fail to play the special interest game, their business will suffer, or they will lose access. Yet the duopoly’s game is not a good game for America—or for business. It has led directly to many of the weaknesses in America’s business environment that we discussed earlier. A convoluted and uncompetitive tax code is the result of decades of business success in winning special exemptions and favors, resulting in a high overall tax rate and capital frozen overseas. Industries have advocated for their pet government projects, but the overall infrastructure in the U.S. is badly lagging and driving up costs for all businesses. The current political game has undermined trust in the fairness of business and diminished public support for pro-business policies, which are increasingly seen as subsidies and special treatment. As we have emphasized in this paper, we must change this game. Business leaders have the clout—and the responsibility—to play a lead role in shifting the nature of competition of the politics industry. It starts with opting out of the existing party influence game and shifting support toward broader business and community interests, and away from narrow special interests. Companies can do much to exert pressure to modify the current process of governing, support candidates who are moderates and problem solvers, and get behind changes in election rules and practices, such as nonpartisan primaries and the other steps we have outlined. The next generation of business leaders—the Millennials—are disgusted with today’s political system. It is time for today’s leaders to recognize the failure of today’s business-government relationship and change it. Today’s CEOs also need to redefine corporate purpose in ways that align strategy and business competition with the needs of society, which will mean a different relationship with government. Business leaders must create a very different set of government priorities for advancing the economy, establishing a whole new relationship between business and political leaders, and generating pressure for action. Changes to the election process are needed to eliminate competition outside the duopoly. Institute nonpartisan top-four primaries. As we have seen, the current partisan primary system is perhaps the single most powerful obstacle to achieving outcomes for the common good. Instead, states should move to a single primary election for all candidates, no matter what their affiliation, and open up primaries to all voters, not just registered party voters. The top four vote-getters from such a single primary would advance to the general election, instead of one winner from each duopoly party. This incentivizes all candidates to present themselves to a general electorate, not just appeal to a small cadre of party-partisan voters. Note that in a nonpartisan primary in a heavily Democratic or Republican district, it may be possible for multiple Democrats or Republicans to advance. In such a case, however, all candidates will be far more incentivized than in the current system to appeal to a broader base of voters and to compete on solutions. Top-two nonpartisan primaries have already been implemented in some states. However, we recommend top-four primaries in order to create more opportunity outside the duopoly (see Fair Vote's Top Four for more information about the benefits of top-four primaries). Nonpartisan primaries would also lower the barriers to entry for independents, such as current ballot access rules and the challenge of getting attention in the media. An independent who makes it out of a top-two or top-four primary would command more media coverage versus the candidate on the general election ballot of whom no one had ever heard. Nonpartisan primaries would also lower barriers to running and create a clearer path for moderates or candidates not adhering in full to their party’s orthodoxy—for example, fiscally conservative Democrats or socially liberal Republicans. Today, such candidates often can’t make it out of either a Democratic or a Republican primary, and a nonpartisan top-two or top- four primary will give them more opportunity to advance. Nonpartisan primaries would also empower legislators to build records of sensible compromise and of getting things done. For example, federal legislators who were considering voting “yes” on bipartisan legislation, like Simpson-Bowles, would be more willing to do so in a nonpartisan primary system, because they would still have a path to be one of the top-two or top-four vote-getters in the primary (instead of being virtually guaranteed to lose their partisan primary). Once through the primary, they would then be able to appeal to the broader general-election electorate based on having done something to advance the public interest. Nonpartisan top-two primaries have recently been instituted in two states: Washington and California. These are major steps forward, and we must build on them.2 These states changed their primary systems through voter referendums—proving that it can be done. The Independent Voter Project played a major role in securing top-two primaries in California (see www.independentvoterproject.org). In moving toward nonpartisan primaries, an initial and interim step can be to move from “closed” party primaries (which allow participation by party members only and which are the rule in many states) to “open” party primaries (in which everyone can vote without being required to register with a party). This will work to reduce the partisanship of primary voters and build momentum toward a fully nonpartisan primary system (see www.openprimaries.org). Institute ranked-choice voting with instant runoff in general elections. Our current voting system is “first- past-the-post, winner-take-all,” which can easily result in a candidate winning with only a plurality (not a majority). For example, in a three-way race, a candidate can win with as little as 34% of the vote (with the other two candidates each receiving 33%), which indicates that 66% of the voters preferred someone else. Ranked-choice voting is a different approach, designed to elect the candidate with the broadest appeal to the most number of voters. Candidates who are opposed by a majority of voters can never win under this system, and no votes are ever “wasted. With ranked-choice voting, citizens can vote for the candidate they like the best without worrying that their vote will help elect the candidate they like least. Thus, ranked-choice voting eliminates the “spoiler” argument. Like nonpartisan primaries, ranked-choice voting is also no longer just an idea. Maine became the first state to adopt this reform in a November 2016 ballot initiative (see http://www.fairvote.org/rcv#rcvbenefits and www.rcvmaine.com and www.represent.us). Institute nonpartisan redistricting. As we discussed in Part II, gerrymandering is the process of drawing legislative district boundaries that create artificial advantage for the party in control. Thirty-seven states currently give redistricting power to the state legislature—effectively handing over control of this crucial part of our democratic process to whichever party is in power.5 Gerrymandering reduces competitive seats and, thereby, minimizes accountability for elected officials (which is exactly the type of behavior one would expect from a self-serving duopoly). Independent commissions should take over redistricting, an approach which has been instituted in Arizona, California, Idaho, and Washington. So progress is taking place.6 Gerrymandering reform across the country will likely require multiple approaches that include litigation and ballot initiatives, among others, because the redistricting power is delegated to states, and each state may need a different strategy for change. Several ballot initiatives to reform redistricting are underway, and progress is also being made on the litigation front. In October 2017, the U.S. Supreme Court will hear oral arguments in Gill v. Whitford, a case brought by Wisconsin voters against the State of Wisconsin challenging the state’s Assembly district lines. In November 2016, a three-judge federal panel in Wisconsin struck down the state assembly district map in question, ruling for the first time in 30 years that a state legislative redistricting plan was an unconstitutional partisan gerrymander. A key part of the case is the plaintiffs’ rigorous three-part statistical methodology for identifying partisan gerrymanders, designed to provide an objective standard to evaluate if a partisan gerrymander has occurred. Previous cases were found to lack a manageable standard. If this ruling is upheld by the Supreme Court, the plaintiffs’ three-part test to provide a standard for identifying partisan gerrymanders will constitute an important tool to fight this political practice across the country (see http://www.campaignlegalcenter.org; and, specifically, see the Campaign Legal Center’s report on partisan gerrymandering at http://www.campaignlegalcenter.org/document/make-democracy-count-ending-partisan-gerrymandering). Rewrite debate access rules for presidential elections. Today there is almost no way to mount a serious bid for the U.S. presidency outside of the duopoly. According to Peter Ackerman, Chairman of Level the Playing Field, “this state of affairs is the product of collusion between operatives from the Democrat and Republican parties who—through the design of hidden rules—jealously guard the perpetuation of their duopoly.”7 One of these hidden rules involves access to the fall presidential debates. A person running as a Democrat or Republican knows that if they win the nomination they will be guaranteed a place in the debates. The Commission on Presidential Debates (CPD), a private organization dominated by partisan loyalists, requires every other candidate to meet a 15% polling hurdle in a three-way race decided just seven weeks before the election. While 15% may seem reasonable, the poll taken so late in the election cycle creates an insurmountable “Catch-22.” The practical effect of this rule is to create a major anticompetitive barrier to any candidates outside the duopoly, and that is why there hasn’t been a third candidate on the Presidential debate stage since 1992. Level the Playing Field filed and won (in early 2017)8 the first stage of a federal lawsuit to change this rule and open the debates, and the litigation is moving through the courts on pace for a resolution in time for the 2020 election. Success in this lawsuit would be an important step to inject competition debates from those outside the duopoly into the debates. (see www.changetherule.org). Political outcomes are affected not just by who wins elections but also by the rules set by the parties to control the legislative and governing process. As a first step toward devising a better system, we propose the establishment of an independent Legislative Reform Commission to design a new set of legislating and governing rules and produce a public report of its recommendations. The Commission should bring together a consortium of leading experts who are independent of the parties and government. We suggest that an alliance of universities jointly create and sponsor this commission. Determine a process (i.e., action steps by constituency) by which existing rules can be changed in order to implement the recommendations of the Commission.This process will likely require intense public pressure on Congress, since Congress controls its own rules. The influence of money is distorting political competition by biasing elections, influencing policies, and creating barriers to new competition. Practical steps are needed to address this. Enact citizen-funding systems to incentivize small donors. For example, the government could match small, private contributions that a candidate raises up to a set amount—either dollar for dollar or at a certain multiple. Establish 100% transparency in political spending— including for currently “dark” spending (i.e., donors are secret), such as spending by 501(c)(4) organizations and Super PACs. Eliminate fundraising loopholes that favor existing parties over independents. Fundraising rules should apply equally to all candidates, including independents and affiliates of third parties. Contact www.represent.us to participate in an activist group pressing for campaign finance reforms across the country. Also read “Blueprints for Democracy” (http://www.blueprintsfordemocracy.org/download-pdf-1), a promising, comprehensive strategy to reform money in politics, jointly developed by the Campaign Legal Center and Issue One (see www.issueone.org). Having said this, diminishing the influence of money alone cannot be expected to transform our political system. The real answer is to dramatically reduce the attractive return on investment that donors currently receive. When we enact the systemic reforms detailed above, the incentive for politicians to respond to constituents will prevail over responding to donors and special interests, thereby reducing the incentive for their spending. As we have described, barriers to new competition from new parties, independent candidates, and even moderates are prohibitive. Implement The Centrist Project’s “Senate Fulcrum Strategy.” A highly leveraged way to break the current political gridlock would be to elect three to five centrist independent U.S. senators with a problem-solving agenda. Ideally, such a group would be large enough to deny either party an outright majority, and thereby become the most powerful swing coalition (i.e., the “fulcrum”) in the Senate. Depending on the policy issue, this coalition could then align with either party, or bring subsets of both parties together, to create a majority to pass legislation providing real solutions to our nation’s toughest challenges. The Centrist Project’s plan includes strategically identifying a small number of states with a political climate favorable to candidates from “the sensible center,” recruiting promising candidates, and supporting them with a campaign infrastructure, as we discuss further on. The genius of this plan is that, while challenging, it is eminently doable because the number of seats required to deny either party a majority is small. This political innovation could bring transformational change to the U.S. Senate as soon as 2018 with a relatively small investment—sooner and for less cost than the longer-term structural reforms we detail in this section. The Centrist Project, which describes its effort as an “insurgency of the rational,”12 would use the leverage of the fulcrum to force change from the political center. Similar approaches could be taken at the state level (see www.centristproject.org). Run (centrist) independents at all levels. Solutions- oriented, independent campaigns would bring critical new competition to politics, and can be powerful change agents. Today, it is difficult to run outside the duopoly and even more difficult to win outside the duopoly. Concerned voters should seek out and actively support such candidates who are running outside the duopoly and who are committed to staying outside it—rather than viewing them as spoilers. Success in some independent campaigns would reduce voter and media obstacles in others, encourage more and more candidates to seriously explore independent campaigns, and generate more funding and election support (see http://independentvoting.org/about-us/). Establish a shared independent (and moderate) election infrastructure. Substantially increasing the number of independents and moderates who run and win will require building an effective shared election infrastructure to help independents (and moderates) surmount the barriers to entry created by the parties. Such infrastructure should include raising large, dedicated campaign-financing pools for independents; building a pool of expert political strategists and talented campaign staff; establishing networks and resources to mobilize volunteers; raising resources to surmount obstacles to ballot access; assembling a core of sophisticated media and marketing talent to execute branding initiatives and media strategies, and to build credibility with voters; and investing in access to shared voter data and analytics capabilities. Ideally, this effort should include Super PACs dedicated to supporting independents (see www.centristproject.org). Create support structures for solutions-minded center-right and center-left party candidates in overcoming primary challengers. Allies of No Labels—a group formed to address Washington dysfunction by getting Democrats and Republicans to work together in a bipartisan fashion—have launched a Super PAC effort for the 2018 election cycle with a dual mandate of protecting pragmatic problem-solving U.S. House members, who are facing primary challenges from the left or right, while also working to defeat the most obstructionist legislators in their primaries.13 Innovations such as this can change incentives to reward problem solving and penalize obstruction, and can help build a coalition of more results-oriented politicians. Expand the “Govern for California” model of state- level innovation. Elections for state legislatures have tended to fall off the radar of most citizens. Yet state legislatures have an important role in the design of our political system, because they control many of the rules governing political competition, not to mention the important state level policies they oversee. The political industrial complex pays close attention to state legislatures, but most citizens are barely engaged. Govern for California’s ultimate goal is to shift outcomes in the California state legislature by electing courageous, independent-minded, and effective legislators. So far, Govern for California has helped finance 14 successful legislative candidates.16 Such efforts, as well as other state-level support models for independent and moderate candidates and elected officials should be expanded (see www.governforcalifornia.org). It is easy to succumb to a “learned helplessness,” as Charlie Wheelan, founder of The Centrist Project and author of The Centrist Manifesto, describes a common outlook on politics. We must reject such passivity. Many of the approaches we have described are beginning to gain traction, as evidenced by the progress in moving to nonpartisan primaries and ranked-choice voting, as well as the gerrymandering and presidential debate litigation we detailed above. These examples are a promising start and prove it can be done. It is worth repeating that the problem in our politics is not the existence of parties, per se. While we support reforms that create opportunities for independents, we believe parties are essential for the system, and parties can help brand and win support for policies, organize voters, and support candidates. The structural reforms we have proposed could lead to a new, more centrist third party. Our purpose here, however, is not to advocate for any particular party or a proliferation of parties. The real problem is the nature of the political competition that the current major parties have created and their insulation from new competition. What is needed is to change the way parties compete, which should lead to their better serving the public interest. The top two parties should always be operating under the potential competitive threat from an upstart that better addresses the public interest. The steps we advocate are designed to create the conditions for healthy (i.e., solutions-oriented and not self-serving) competition, and to hold incumbents accountable for serving the public interest. Then our democracy can take over, with existing parties transforming themselves or a new party coming into being, if that’s what voters want. Let’s not forget that the health of competition between our major political parties has eroded substantially in the last several decades (see Part V). Historically, other parties, including the Federalist, Whig, American (“Know- Nothing”), and Free Soil Parties were all prominent. The idea that we are—or should be—stuck forever with the Republicans and Democrats in their current form is just historically unsupported. Given that today’s parties have become self-serving—to an extent that may well be unprecedented, just like those corporate executives who have enriched themselves at the expense of their shareholders—it is time to open up competition to bring politics back to serving the public interest. Historically, America’s political system was the envy of the world and a crucial foundation of our nation’s success. The system advanced the public interest and gave rise to a long history of policy innovations. But today, our political system is divisive and stands in the way of progress on virtually every important issue our nation needs to address. We believe it has become our nation’s single greatest challenge. Today, the influence and the perverse incentives of the political industrial complex have become our greatest threat. Our political system will not be self-correcting. It is doing what it is designed to do. Structural change is required to reestablish healthy political competition that advances the public interest and delivers solutions. We citizens bear the ultimate responsibility for knowing what is good for our society and insisting on change. We can never forget that the political system we have today was designed by our own elected representatives—the people we voted into office. This system was corrupted over time, and most of us did not even notice. U.S. states (excluding federal funds) collectively spend that much in less than four months, and our federal government spends that much in just over five weeks.22 Philanthropy is no substitute for effective government. Given our failing political system and its effect on virtually every social and community issue, we need a new kind of philanthropy in America. It might be called “political philanthropy” where donors (to political reform, political innovation, and solutions- oriented candidates) prioritize the general interest over any personal or special interest.23 Substantial investments will be required to achieve the reforms outlined in this report: changing the rules in Washington, and even state by state, and creating the infrastructure and financing necessary to support independents and moderates. Arguably, political philanthropy offers the best potential return on investment of any form of philanthropy today. As David Crane, co-founder of Govern for California, makes clear in his work, success in improving government effectiveness, policy choices, and policy implementation would result in more effective spending of public resources and have a major impact on the actual progress our country makes on improving health care, public education, and anti-poverty efforts, to name a few. Now is the time for concerned donors to redirect a portion of their philanthropic resources to the cause of revitalizing our democracy. In the end, political philanthropy may well now have the greatest impact on advancing our society.